Widely hailed as a “powerfully written” history about America’s beginnings (Annette Gordon-Reed), New England Bound fundamentally changes the story of America’s seventeenth-century origins. Building on the works of giants like Bernard Bailyn and Edmund S. Morgan, Wendy Warren has not only “mastered that scholarship” but has now rendered it in “an original way, and deepened the story” (New York Times Book Review). 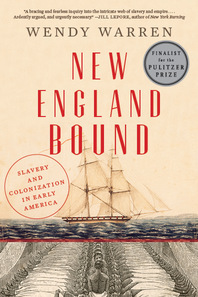 While earlier histories of slavery largely confine themselves to the South, Warren’s “panoptical exploration” (Christian Science Monitor) links the growth of the northern colonies to the slave trade and examines the complicity of New England’s leading families, demonstrating how the region’s economy derived its vitality from the slave trading ships coursing through its ports. And even while New England Bound explains the way in which the Atlantic slave trade drove the colonization of New England, it also brings to light, in many cases for the first time ever, the lives of the thousands of reluctant Indian and African slaves who found themselves forced into the project of building that city on a hill. We encounter enslaved Africans working side jobs as con artists, enslaved Indians who protested their banishment to sugar islands, enslaved Africans who set fire to their owners’ homes and goods, and enslaved Africans who saved their owners’ lives. In Warren’s meticulous, compelling, and hard-won recovery of such forgotten lives, the true variety of chattel slavery in the Americas comes to light, and New England Bound becomes the new standard for understanding colonial America.